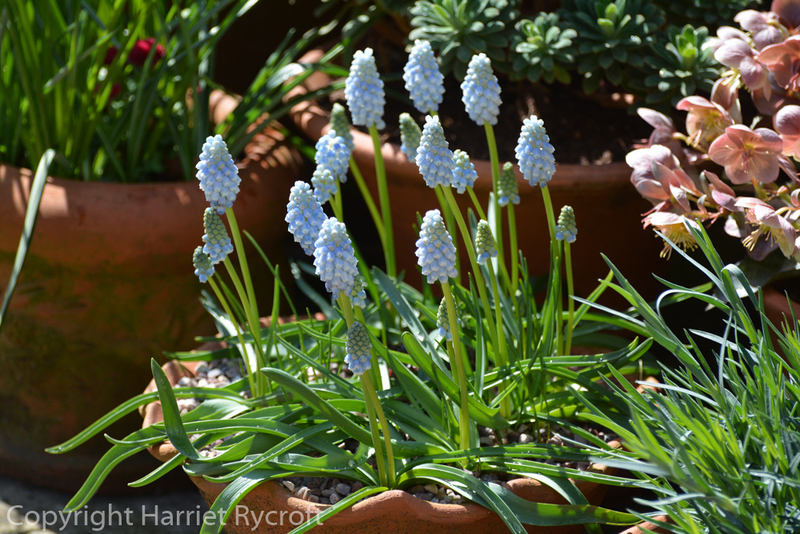 This little powder blue grape hyacinth has been flowering in my back door pots for at least three weeks now and is still looking pretty good. I do like it when a plant is well named, so it is very pleasing that the flower spikes have minty green tops to them when they are young and the whole effect is fresh and clean. Even after a month. They look sweet and prim planted by themselves, remaining relatively compact and upright; the flowers were preceded by neat little rosettes of leaf, not the great tangled swirl that arises from the “usual” darker blue Muscari armeniacum. 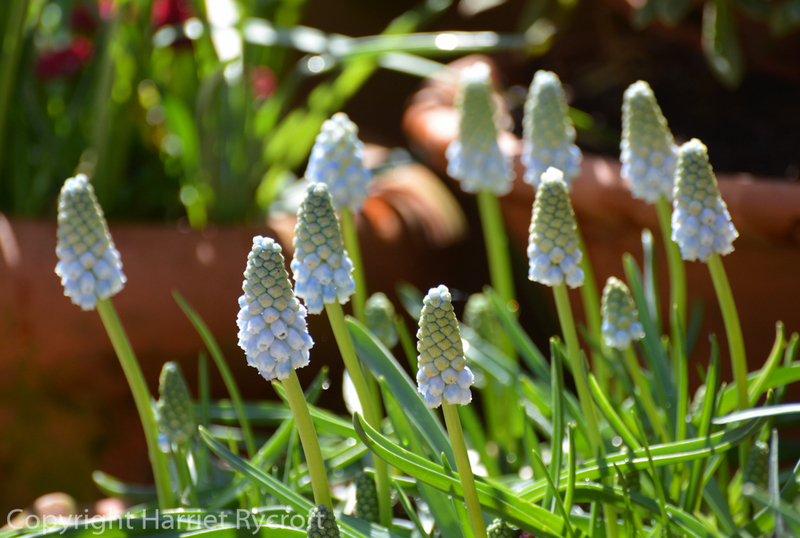 The individual florets on Muscari armeniacum have always reminded me of Victorian-style bloomers, I imagine the garden pixies gambolling about in them. Oh all right, I don’t, but you can see how dinky they are. They seem very well-behaved, I’m sure they aren’t as rampant as the bog-standard species. Glowing in the gloaming last night (5 May). Where are the pixies? 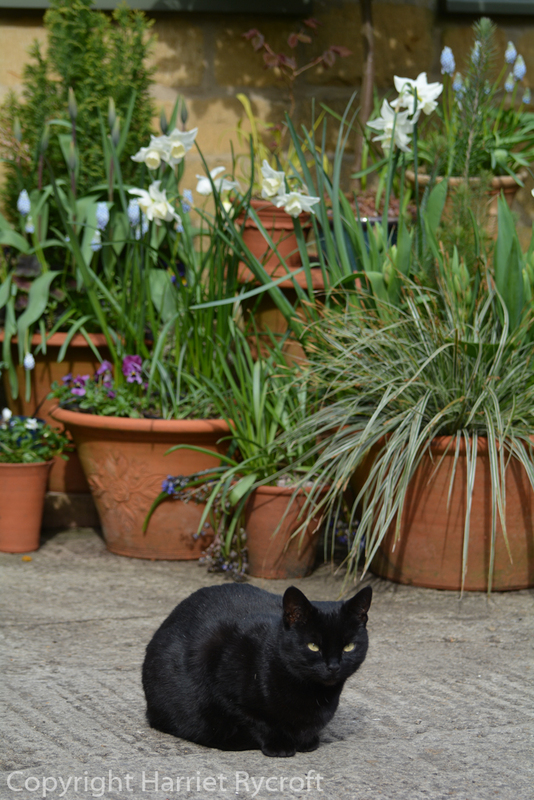 They also perform really well in my mixed plantings at the feet of tulips and among Bellis perennis, Heuchera etc. In those pots they grow a little taller so that they can still see out but that doesn’t make them floppy. What more could you want? Fragrance, I hear you say – well they smell sort of… green. But a nice green. I haven’t noticed the bees paying much attention to them but they are in a fairly shady spot, so maybe the fragrance isn’t reaching very far. Slugs, snails and greenfly haven’t touched them. 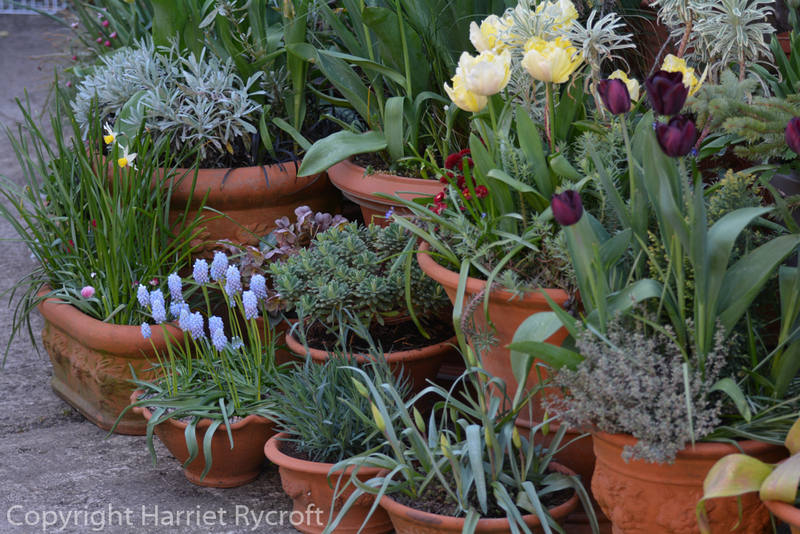 I’m glad I bought 50 of them, because it meant I could have them in big pots and little pots at different heights in the display – as in the garden I find repeating flowers (even little ones) in a bank of pots helps to bind the display together. I bought the bulbs from Peter Nyssen – but don’t all go ordering them because I shall want more next autumn! At this point Minnie would like to point out that pale blue looks very nice with black. 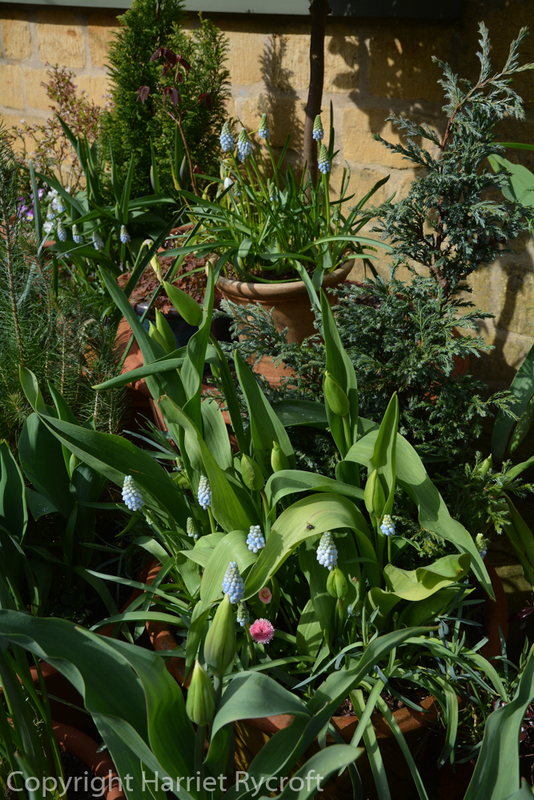 Grown that muscari for the first time this year and it has been a complete star. Love your idea for a shady pot. I am aiming to plant a few more different varieties next year in shallow pans. Any recommendations? Hi Philippa, glad you agree! 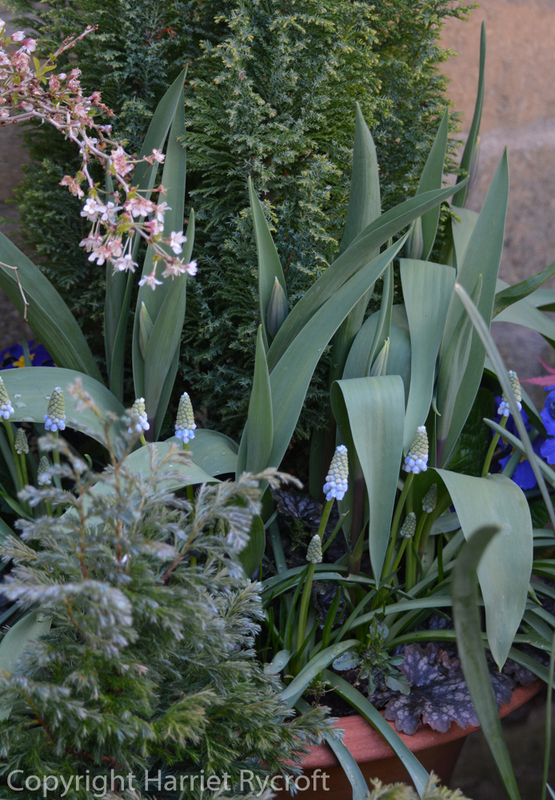 Muscari ‘Siberian Tiger’ is just getting going here and looks very pretty too. One of best things for me this year in the pots has been Chionodoxa sardensis, really lovely. I wonder if ‘Peppermint’ is related to ‘Valerie Finnis’ which is much the same color. “Valerie” is the only one I’ve seen so far in commerce in this lovely Wedgwood blue, and it’s been one of my favorites for a long time. 🙂 I wonder why it has taken so long for a similar one to appear? Yes, I’ve grown ‘Valerie Finnis’ until now but I’d say this is neater and longer-flowering. Would have to check back thru notebooks & pics to be sure though.